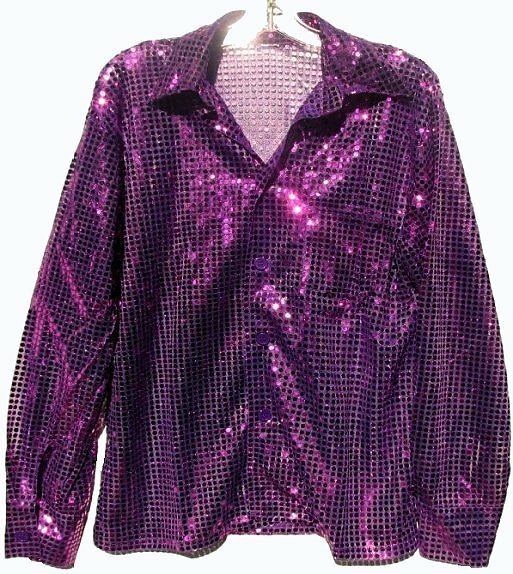 This new version of my purple sequin button up shirt is wildly reflective. The background fabric is purple too and not quite as sheer as it looks above. My lighting overexposed the background fabric a bit. This new version has larger sequin dots than that of previous shirts. The sequins on these have a mirror ball effect. They reflect more than the shirts with smaller sequin dots. The shade of the sequin dots is a bit of a violet purple. The background fabric is a truer or darker purple. The cut is wider through the stomach area on the new shirts. My older version was long and narrow. Four Styles of Disco Chains are available at the bottom of page. Fabulous Blue Tint, Silver Mirror or Reg. Tint Aviator Sunglasses are available further down. Shirt should be hand washed or dry cleaned, not machine washed after worn. Hang dry.